If I had to buy a beer for everyone who helped out on the Rickshaw Run - well, let's just say we'd be on a baked-bean diet that week. The way the westie community pulled together to pull it off was just amazing. 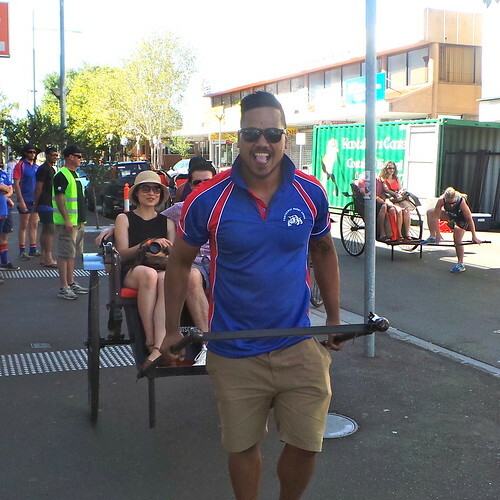 I do need to say a special thank you, though, for a very special collaboration between the Rickshaw Run and the Footscray Rugby Union Club. When these guys came on board and agreed to staff an entire shift, I offered to write a post about the club on Footscray Food Blog. What I didn't know was how perfect a fit the club would be for the Rickshaw Run, and how genuinely happy I'd be to spread the word about them. 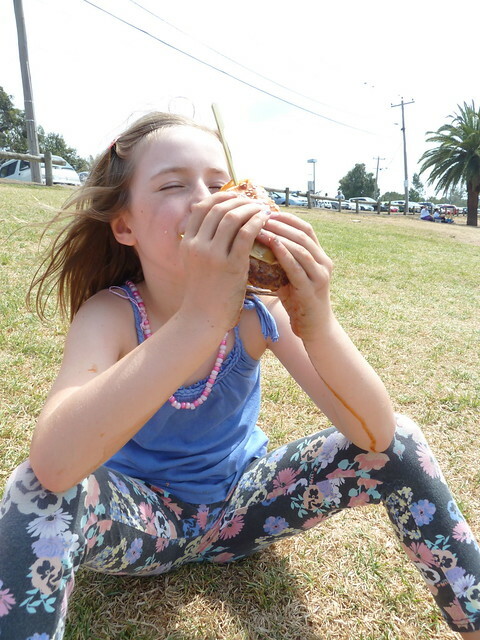 So read on for more about this dynamic, friendly grass-roots club - plus a very cool, very westie foodie connection, and how you can get a piece of it! 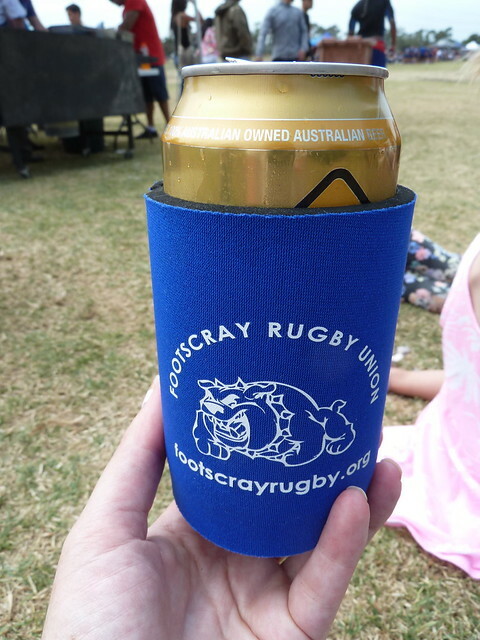 Footscray Rugby Union Club was founded in 1928. The Dewar Shield is the premier Victorian rugby competition, fought out between nine teams who represent 125 years of rugby in Victoria. Footscray currently have senior men's teams contesting at this top level. 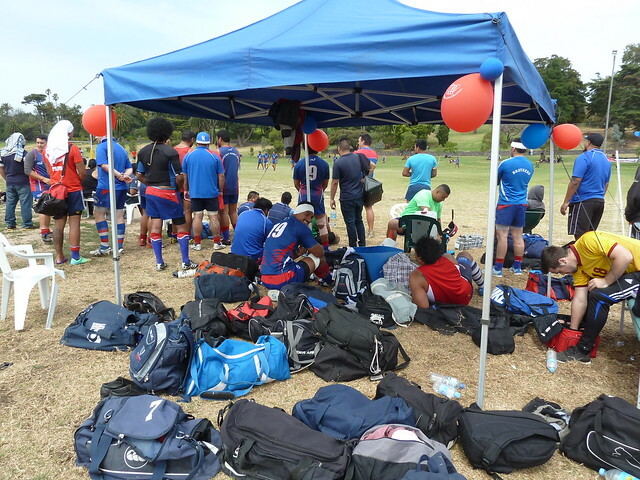 Footscray also has a junior pathway program that starts with kids aged 6 to 10 who learn the game in a fun and safe environment while building on their motor skills and coordination. 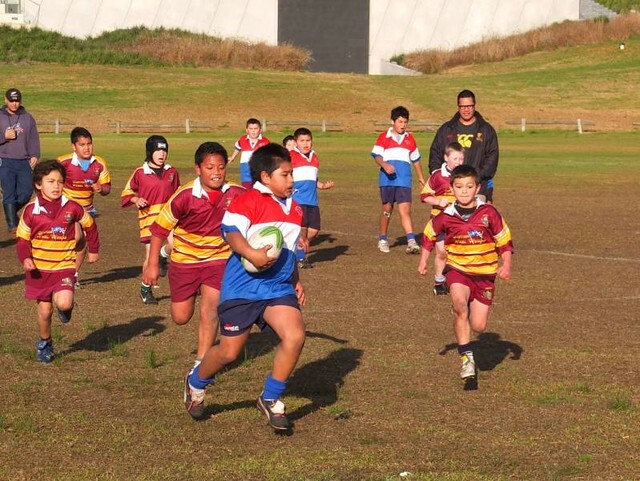 There are U12, U14 and U16 rugby teams that compete against other teams across Melbourne. 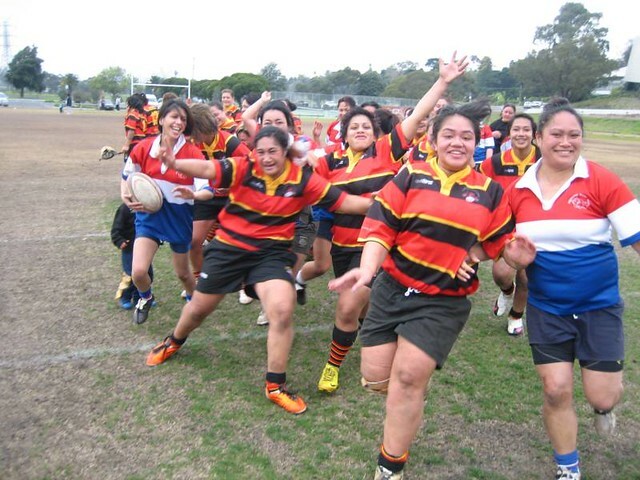 FRUC's women's teams are comprised of three independent rugby clubs, with a strategic viewpoint to grow the game across the western suburbs of Melbourne. They include Brimbank, Footscray and Melton rugby clubs. There are currently six women's teams contesting this season, with FRUC's team - the Western Districts - having been very successful in preseason fixtures. You don't have to be an expert to come and play. The club currently has four different grades, which means that everyone can find a level at which they're comfortable. 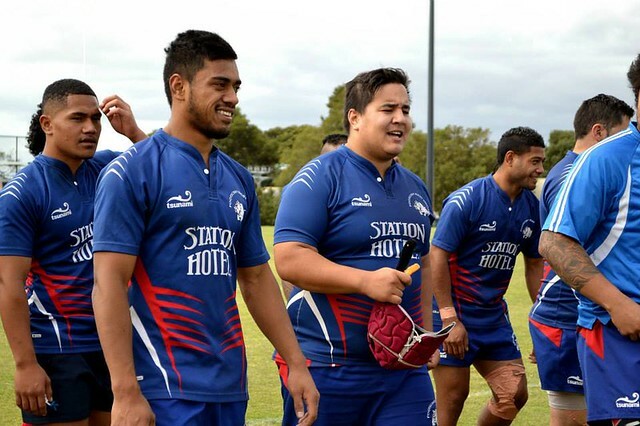 Leki Sisifa of FRUC explains: "We have rugby teams to cater for players looking to push for higher honours to the weekend warriors hoping to throw the ball around with some friends. 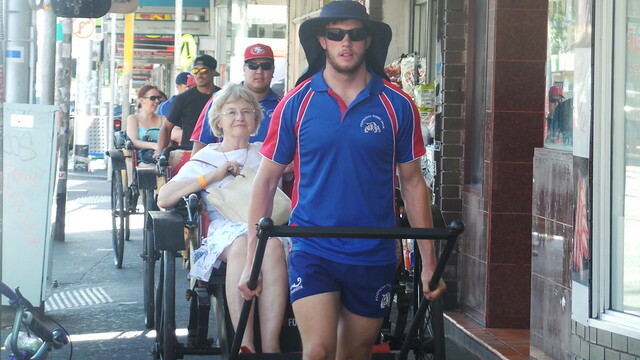 Footscray Rugby Union Club is happy to accept players of all shapes and sizes regardless of skill level. We are a very inclusive club". Rugby Union in Victoria obviously plays a very far second fiddle to AFL, but to me, there's something good in that. 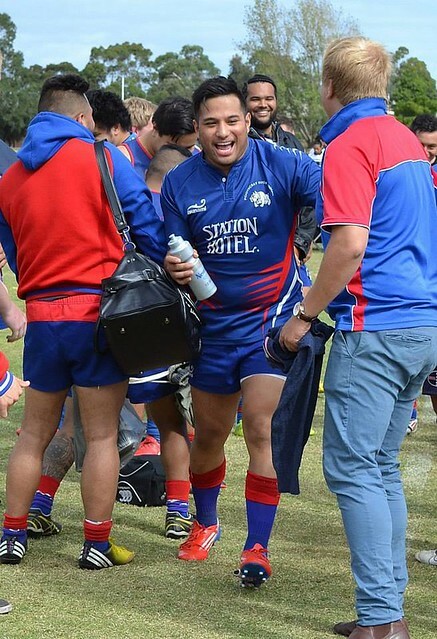 The Rebels (Melbourne's state-level rugby team) are required to play in comps for clubs that are at Dewar Shield level. To me, this means more genuine involvement between top-level players right down to kids just starting out. 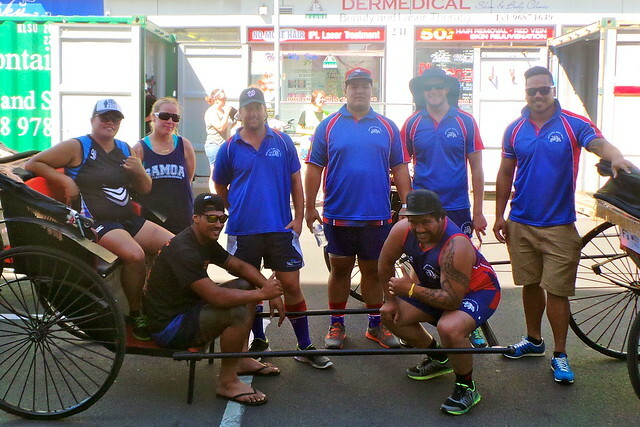 Footscray Rugby Union Club's volunteer representatives got so many positive comments from guests on the Rickshaw Run. They made such a great impression that they even got a mention in Federal Parliament! And that foodie connection? 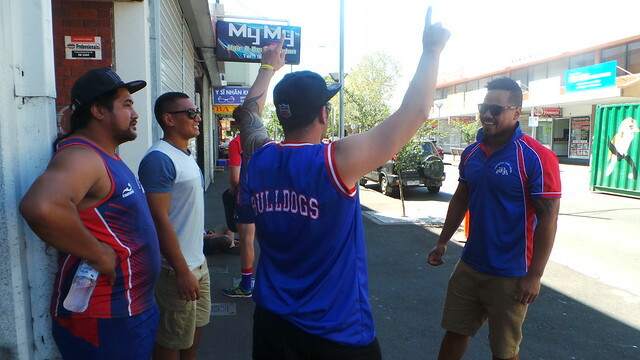 Sean Donovan of the Station Hotel (on the right) is a keen player for the Footscray Doggies, and the Station Hotel is a proud sponsor of the club! 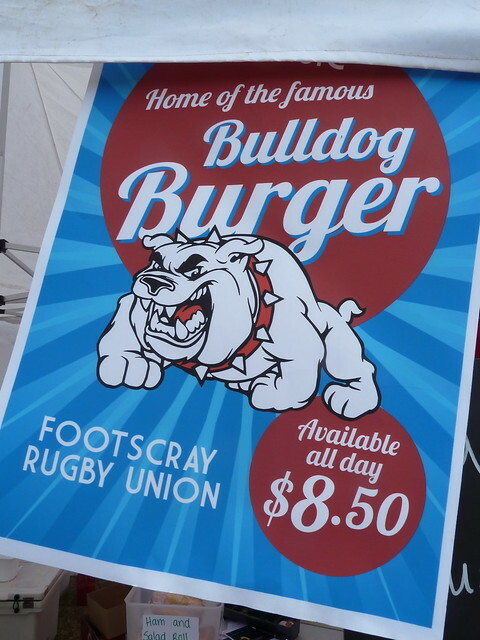 Sean has been instrumental in creating Footscray Rugby Union Club's signature home-game offering - the Bulldog Burger. 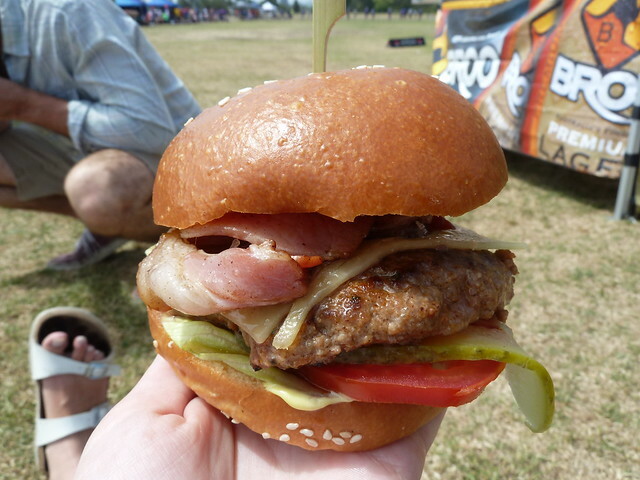 For a mere $8.50, you get a Station Hotel-quality two-hander - a beef patty, pickles, bacon, cheese, mustard, mayo and ketchup on a brioche bun. The next home game is this Saturday 26 April at Henry Turner Reserve at Footscray Park. Everyone is welcome to come down and enjoy the game. The fixture is 3rd grade at 12 noon, 2nd grade at 1.30pm, 1st grade at 3.10pm and 4th grade at 3pm. 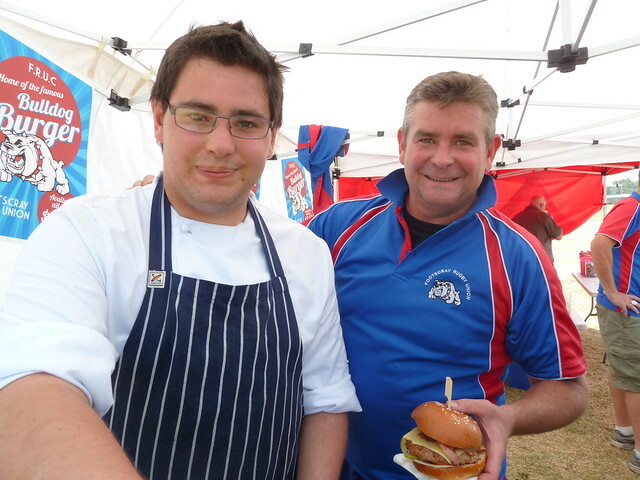 The Bulldog Burgers start sizzling at about noon. There's also beer for sale from Broo, brewed on the Mornington Peninsula. Love that it's in tinnies! From my own experiences with my kids' sports, running a sports club is darn hard work. In my dealing with FRUC, I've been genuinely impressed with their professionalism and commitment to the club. One more reason to join - the Station Hotel do the after-training meals for players! We're talking spicy bolognaise, steak sangers, and sausages with mash and onion gravy. PS: Did you know the Station has a blog, complete with the recipe for their lick-the-plate-good bearnaise sauce??? What are the three sweetest words in the English language? The Golden Horse has just opened on possibly Footscray's best corner site, and is ready to feed you these sweet nothings seven days a week. 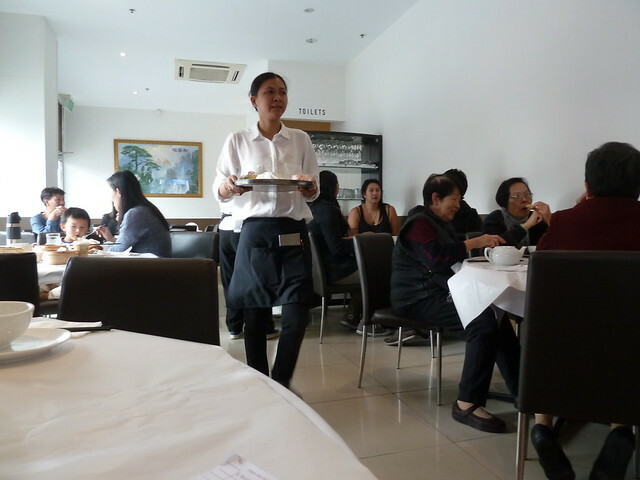 There aren't many small yum cha restaurants like this around. 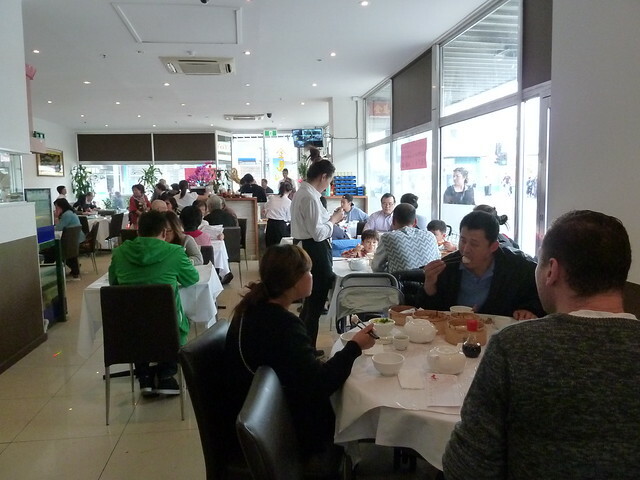 Usually when a yum cha place is small, it means no trolleys, or a very small range of food. That's not the case here. 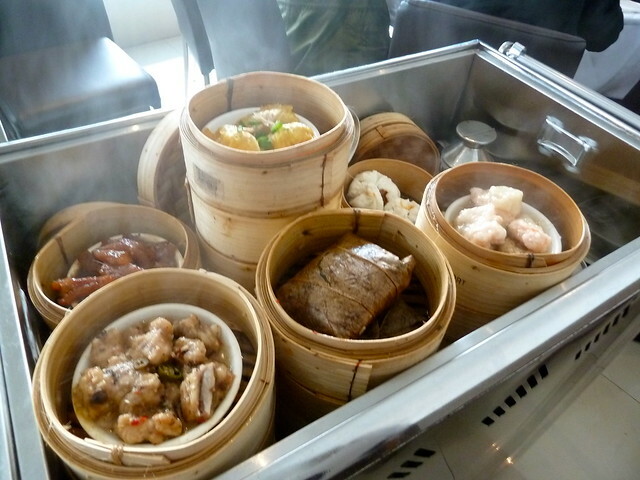 Golden Horse have a great range of dim sum, and it's not dumbed down - I spied chicken feet, pork ribs, tendon and silken tofu with prawn. The small space does mean it's tricky to get a table of exactly the size you require, which means you might have to share a table. I felt pretty sorry for the couple who had to share an eight-seater with me and my three grotty kids, but luckily the first trolley hit within seconds of sitting, so I could plug them with food straight away. 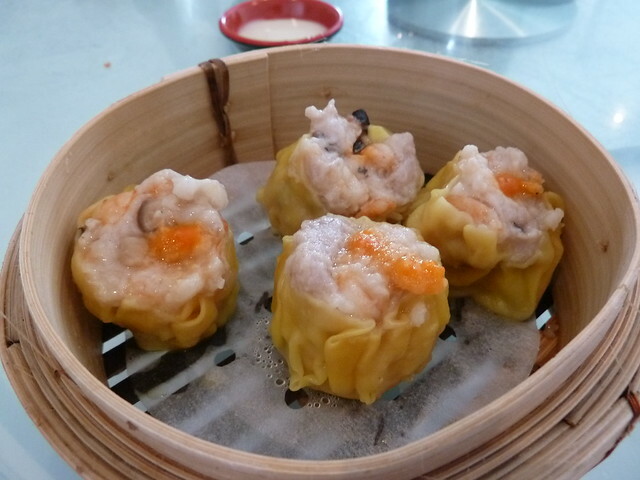 Shu mai, or "the ones with the dot on top" as they're known in our family. 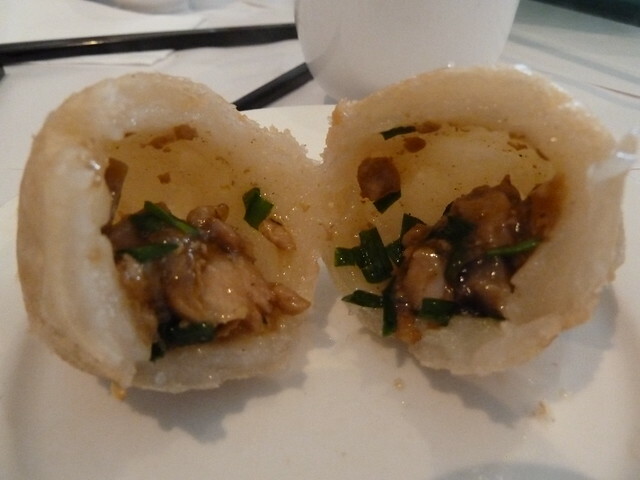 They're made from prawn and pork with a wonton wrapper enclosing the bottom and sides. 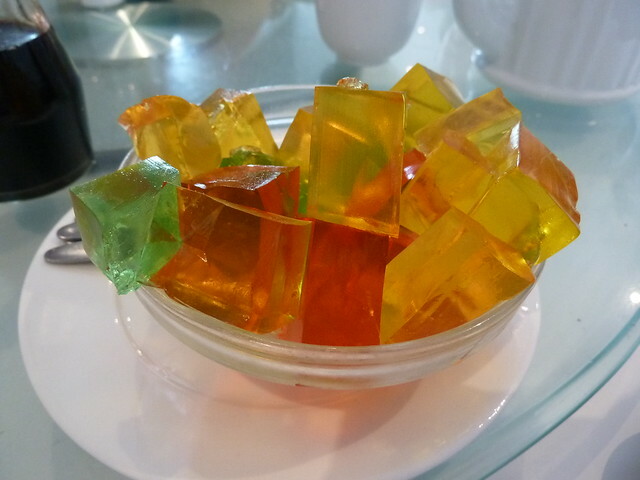 These were really chunky and quite awesome. Love how you get four to a basket rather than the usual three! 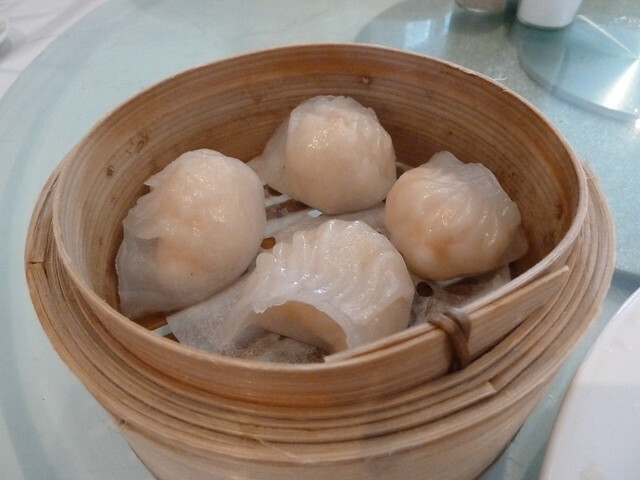 An equally generous serve of har gao or prawn dumplings. Great. 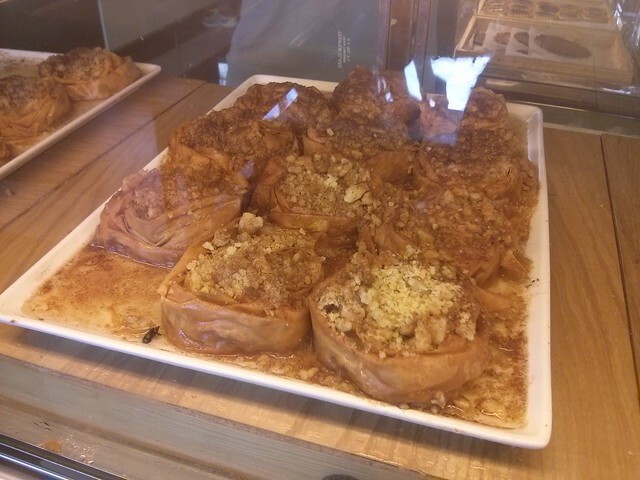 Ridiculously amazing pastry - short, flaky, feathery and totally melt-in-the-mouth. It was curled around a jammy BBQ pork filling. 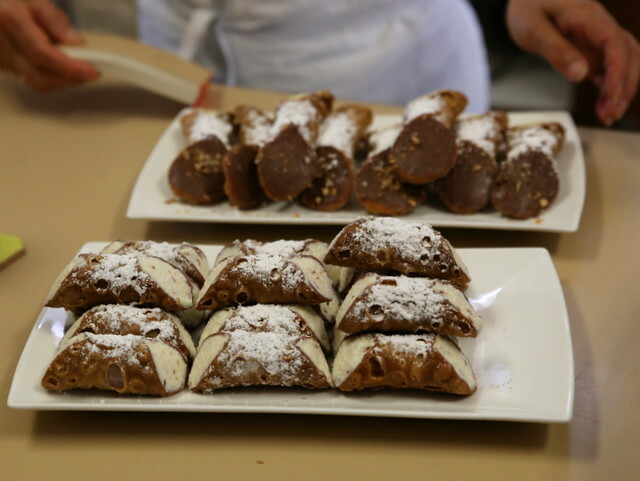 Pounce the minute you see these come out of the kitchen. 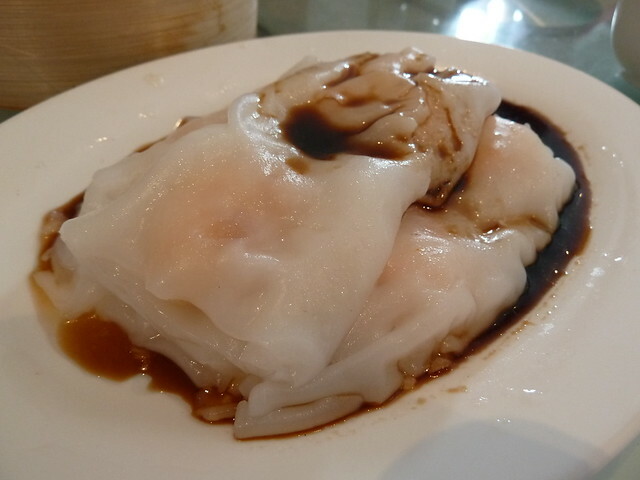 These prawn noodle rolls are one of my favourite things - big noodle sheets (like lasagne sheets) flopped around prawns. Pro tip - attack these with an empty bowl, ie, not one full of soy sauce. The sauce with these is really light and sweet and deserves to be enjoyed on its own. 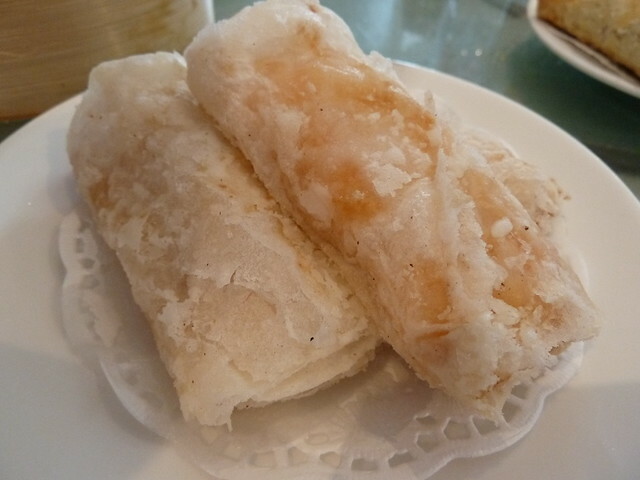 Crisp prawn rolls, I believe wrapped in rice paper, served with a little dish of mayo. 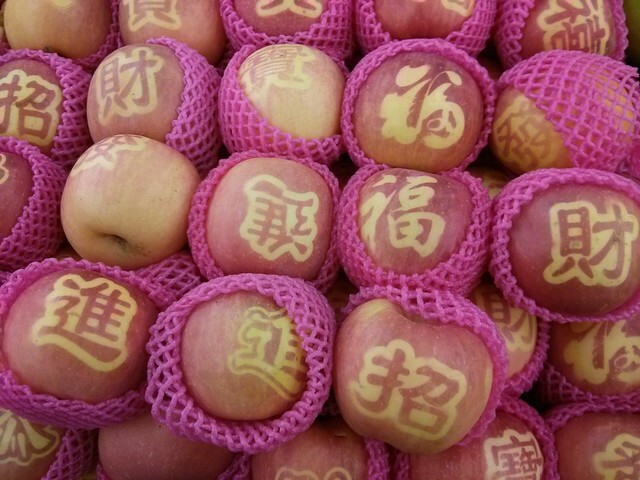 Also try the very similar golden brown-coloured variety, where the prawn is wrapped in fried bean curd skin (those ones come with a violently coloured yet delicious sweet-and-sour sauce). 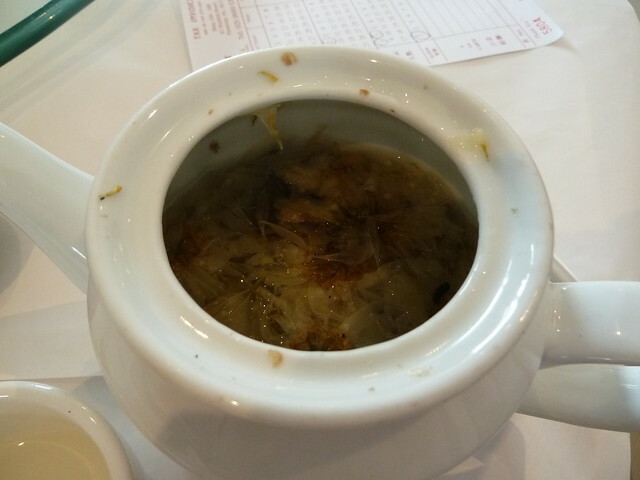 Forgo the standard jasmine and order some chrysanthemum tea. It has a fresh taste, a little like chamomile but much more gentle. Ham sui gok, aka "football dumplings". 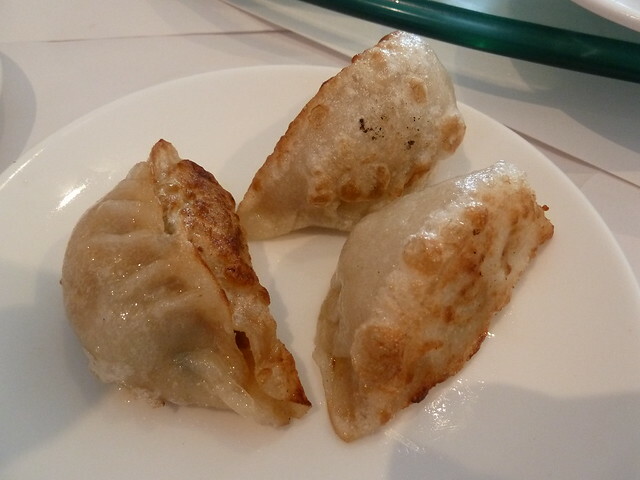 These have a glutinous rice flour batter around a filling - normally pork mince and a bit of mushroom. These ones had a pretty filling with chopped pork and a little (what I think is) Chinese chive. With the perfect crisp exterior and warm, slightly gummy interior, they were great. Try these with chilli sauce. Wasn't a fan of these panfried dumps - they were not hot enough. 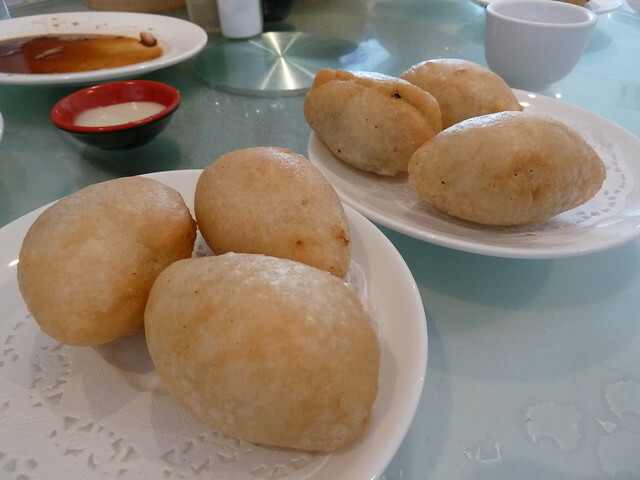 Honestly, I'm never a huge fan of this type of dumpling (jiao zi) at yum cha. 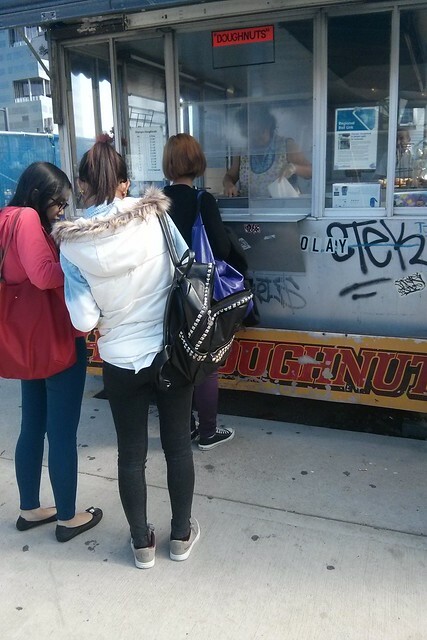 If you want fried dumplings, go order a whole plate for ten or so bucks at 1+1 across the road. This squid obviously never skipped leg day. 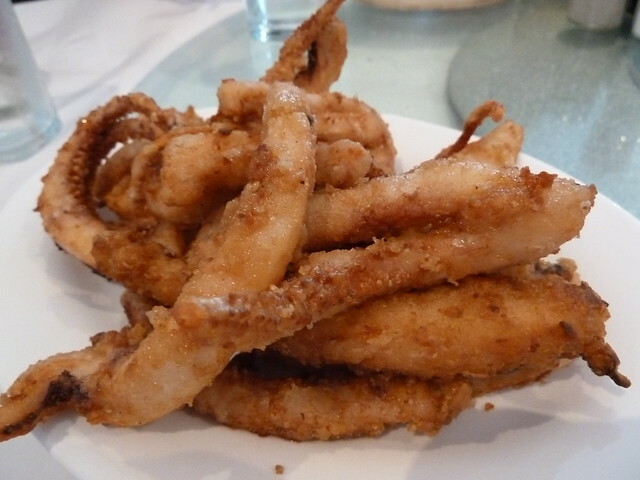 Even though these calamari tentacles were really big, they weren't tough, and the light coating was great. 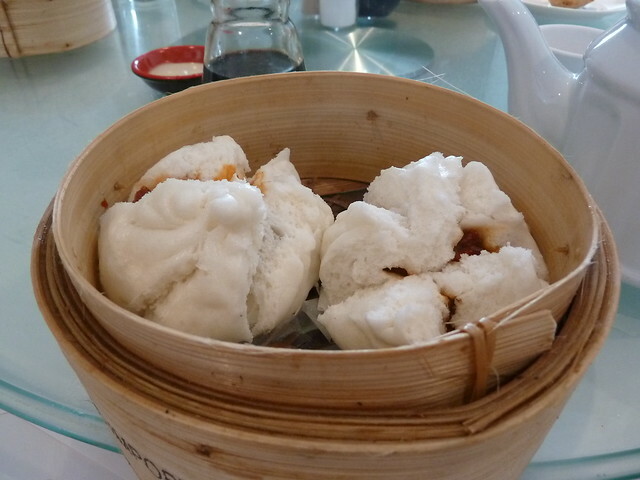 Just enough room for char siu bao - fluffy steamed buns with a warm dob of BBQ pork in the middle. Barry's dad is also a chef at the Golden Horse. He did his formal training in Hong Kong in the 1970s with an apparently very highly regarded chef of the time, and one of his fellow students was the current head chef of Laksa King. He has been cooking since he was eight, including up and down the length of Vietnam. As such, Barry reports that he was exposed to French techniques and ingredients. His signature dish is snow crab with foie gras. CAN YOU SAY HELL YES?! Dad's other specialty is his XO sauce. 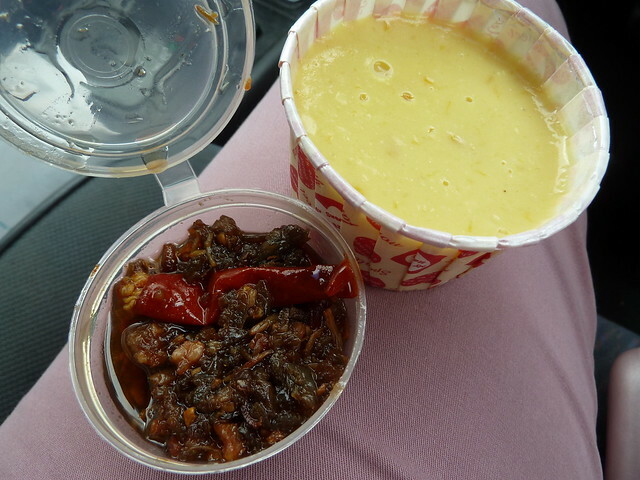 Barry kindly gave me this little pot to take home and try, while the kids all got a mango pudding each. The sauce is a knockout and the puds were all fantastic - they had tiny little real mango bits in them. I really like the Golden Horse. Eating yum cha in a big dim sum barn can feel like you're on a conveyer belt, but this is a really friendly little place. 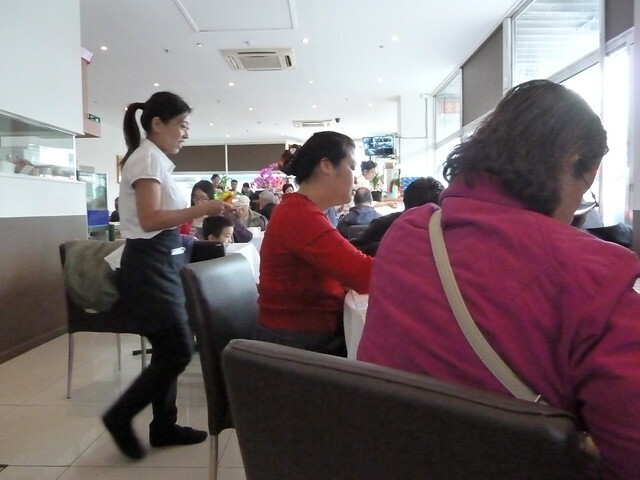 This site is an iconic one for the suburb, and it feels so right to have a big, busy yum cha restaurant full of people right here in the guts of the 'scray. I love that everything's made here, and afterwards the insatiable salt/MSG-induced thirst that normally attacks me after a yum cha session was nowhere to be found. Can't wait to come back in the evening and try the a la carte stuff. 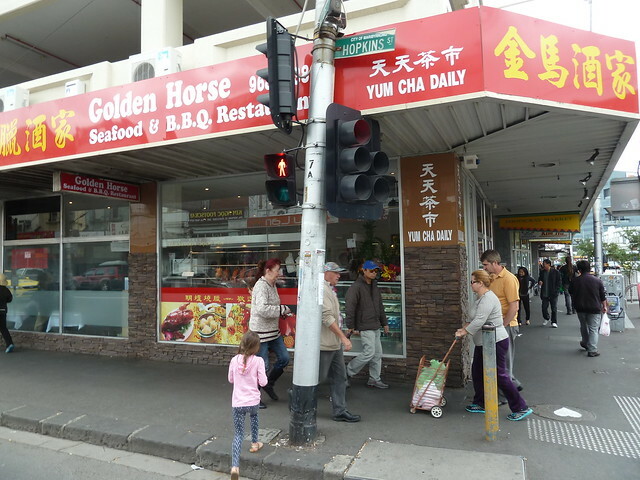 You could say Footscray is now a one-horse town, and I think it's all the better for it. 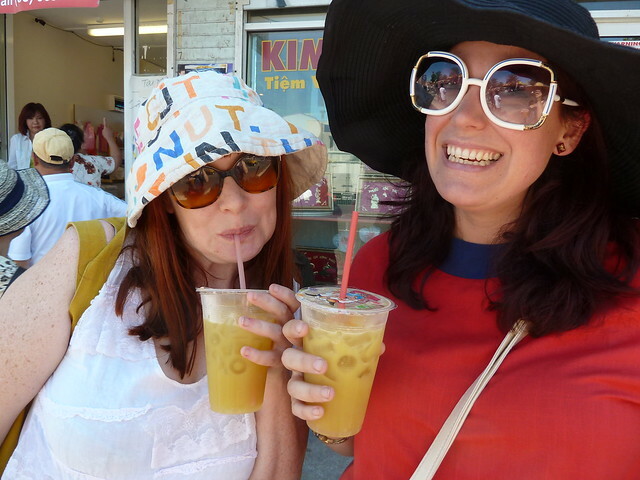 Footscray food tours - new dates! ...or these lovely friendly faces. 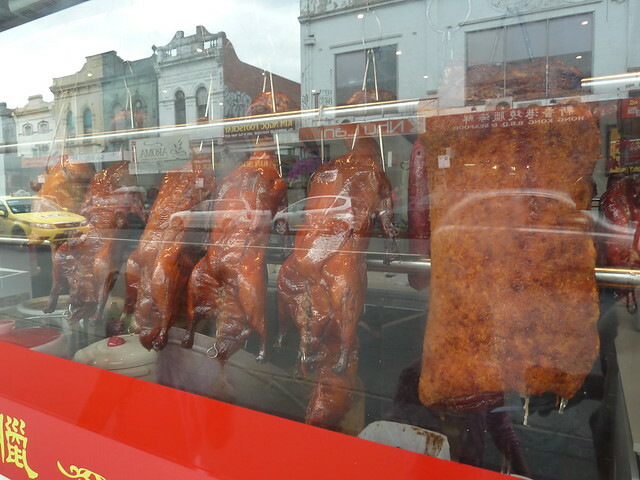 Whether you're a newer resident or an old hand keen to find some new favourites, I would love you to join in the next round of Footscray Food Blog's Footscray food tours. My tours are completely independent, hosted by me, with small groups and packed full of information, stories, and delicious treats! I have two itineraries for you to choose from. 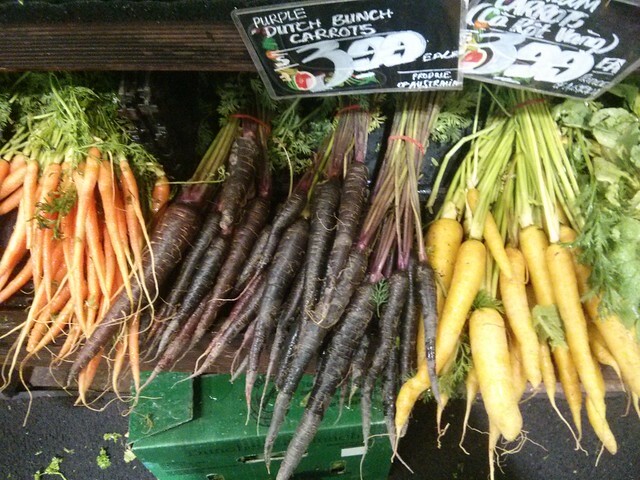 The Footscray Fresh Food Ramble is a market-based tour loaded with shopping tips and samples. 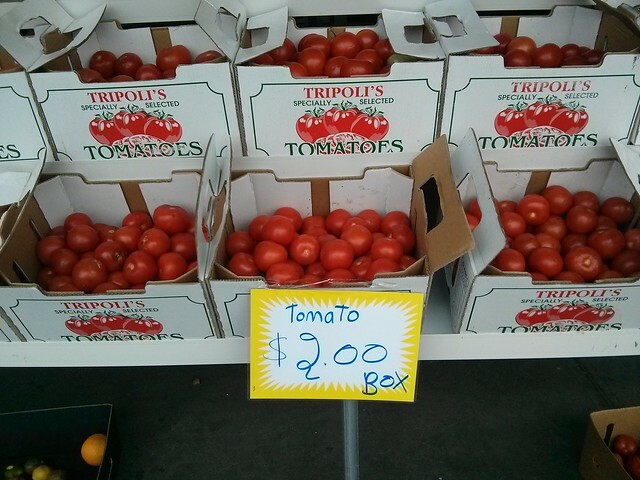 If you're a newer resident who feels a little intimidated by the markets, or if you're simply curious about where to buy avocados for not $4 each, but $4 per kilo - this is the tour for you. 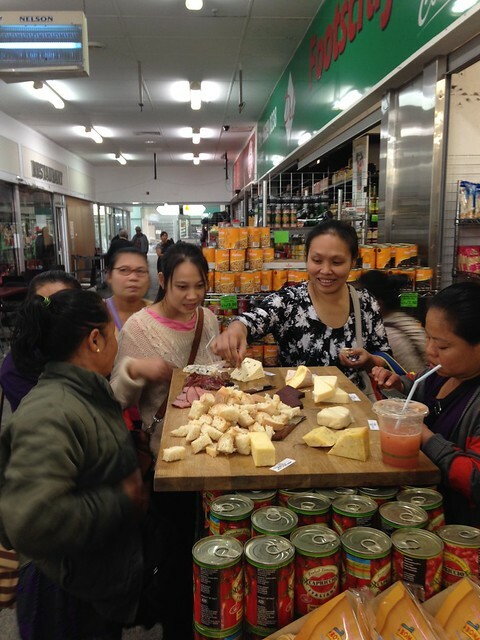 Hobsons Bay City Council booked a private tour based on the Fresh Food Ramble, in which I introduced a group of lovely Karen people to cheese for the first time! 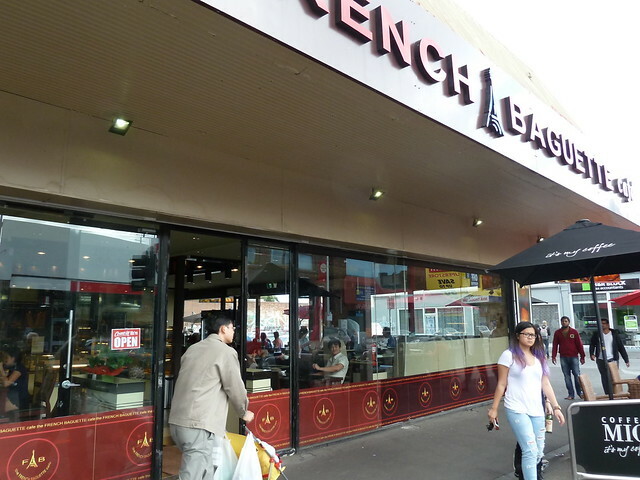 It was a smash hit - they bought Footscray Market Deli's entire stocked of washed rind! 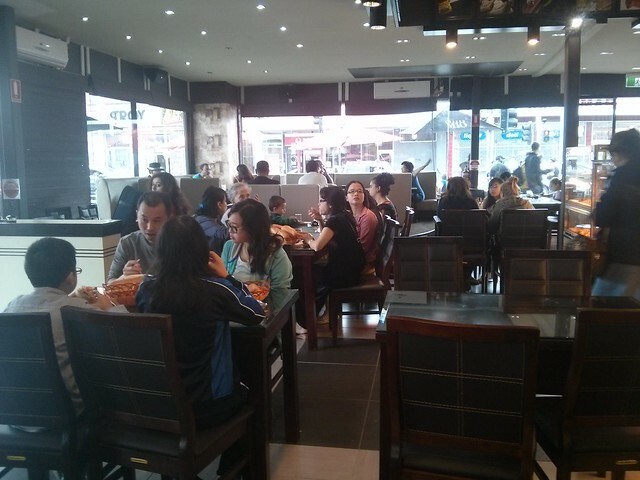 Or maybe you'd like to explore Footscray's amazing multicultural community - and what better way than stomach first? 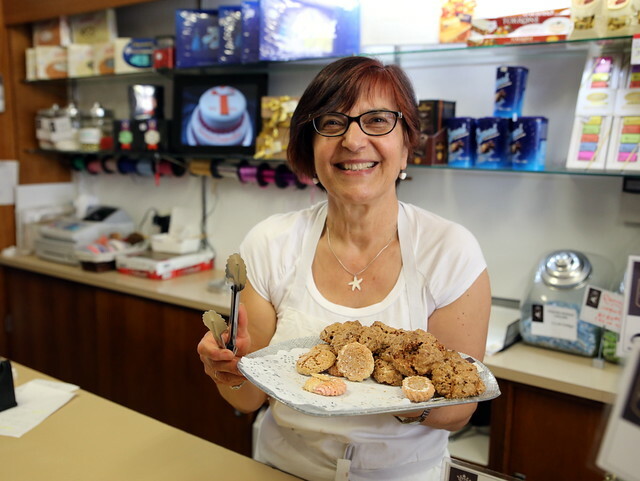 On my Streetwise Snacks tour, we'll say g'day to the fantastic friendly folks in our amazingly diverse community while sampling their tasty wares. 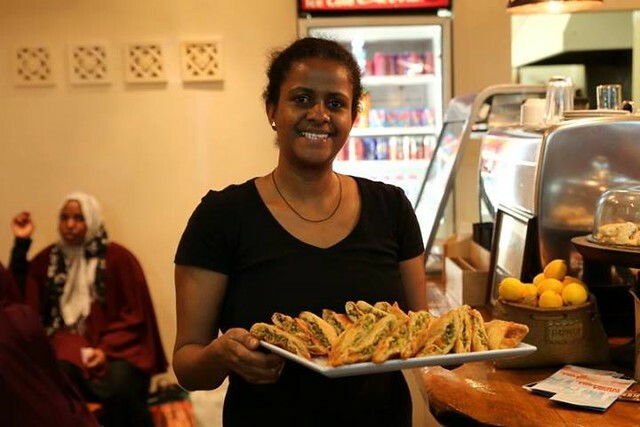 Think Somali street food, burek two ways, delightful desserts and more! 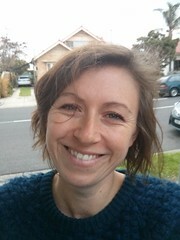 About the Footscray Fresh Food Ramble, Sasha from Yarraville said: "I had a ball on the Footscray food tour with Lauren. The markets have been on my doorstep for years but I just didn't have the knowledge or confidence to utilise them. Ever since the tour I have been back at least twice monthly and I am loving the quality and the prices! Lauren is really knowledgeable and passionate about the markets and the produce and I picked up a lot of good tips from her." 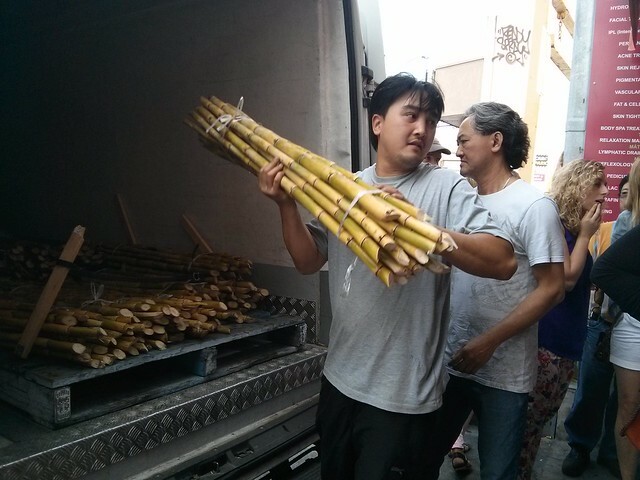 ...and about Streetwise Snacks, Brett and Jenny from West Footscray said: "The tour is such a great way to explore the many hidden treasures of Footscray. Lauren took us to all the best spots and gave us plenty of tips on what to keep an eye out for... A must for any worldly foodie (and those of us wannabes). 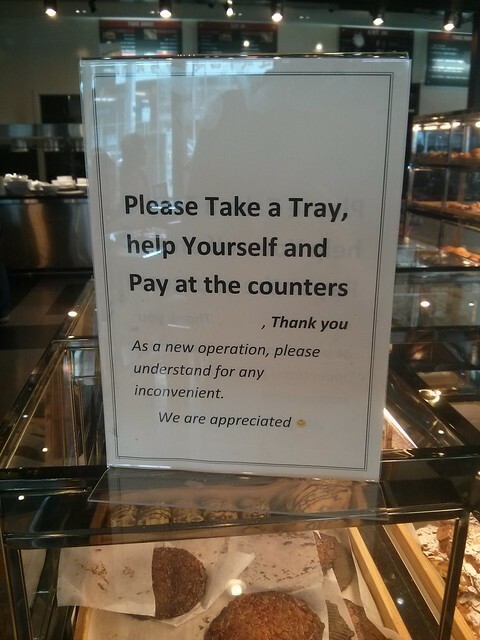 You certainly won't be left hungry! So much food!" NB: This tour is suitable for babes-in-arms or young toddlers, but due to the group size, please pop them in a carrier (eg, Baby Bjorn or Ergo), not a pram. HOW TO BOOK: CLICK HERE TO GO TO MY TRYBOOKING PAGE. DURATION: Was 1.5 hours - NOW 2 HOURS! INCLUDES: Enough snacks to constitute a generous lunch! I also run private tours which can be tailored to your requirements - they make a fantastic team-building opportunity for businesses and brilliant gifts. 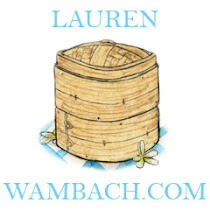 To find out more, get in touch with me on 0438 583 808 or lauren@laurenwambach.com. Come on and dive in! 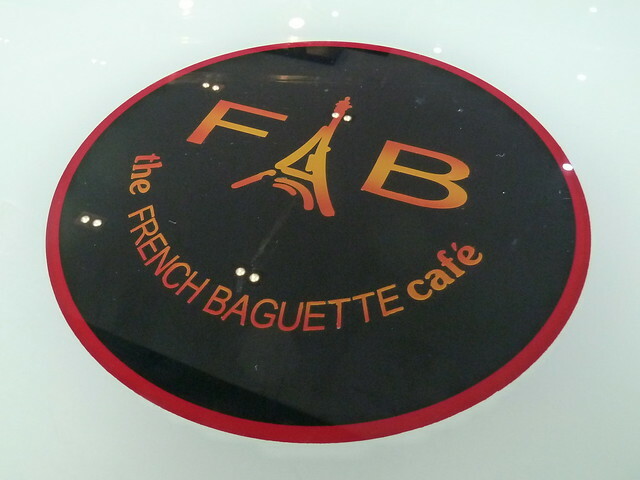 The new French Baguette Cafe has taken so long to open - maybe, I don't know, a good year - that after a while, the Eiffel Tower in its logo started to look to me like a big middle finger. Now that it's open, I think the Eiffel Tower in the middle actually makes the initials look less like "FB" and more like "FAB" - so I met up with a few folks to see if it lived up to its name. It's really big inside, with large comfy chairs, including a few on a raised dais. 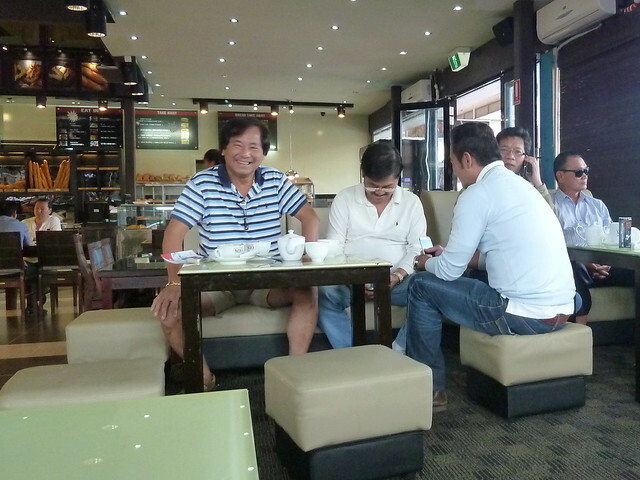 On a Saturday morning, it was full of folks enjoying coffees and a good old chinwag. 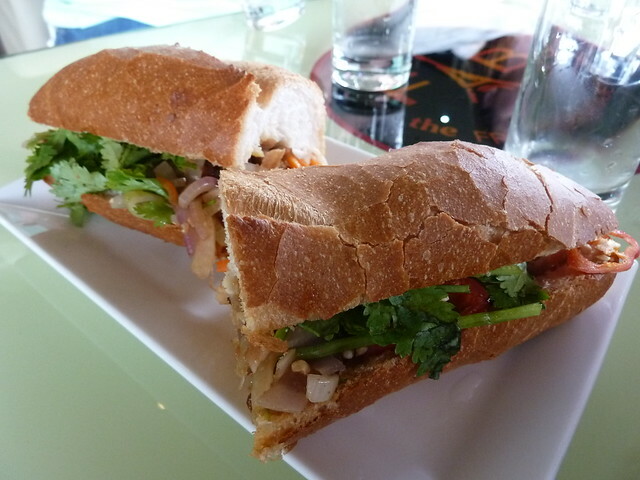 We hot-footed it straight to the banh mi. There are all the classic fillings like mixed ham, meatballs and fish cake, plus grilled options including chicken, pork and (unusually) beef. 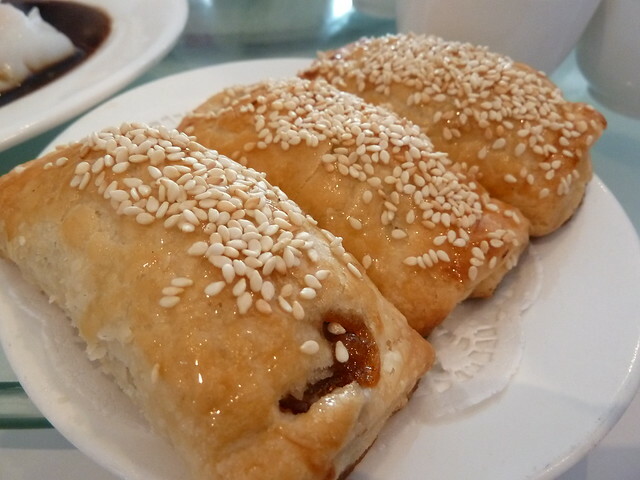 The rolls are particularly big - I think a good 5 cm longer than Nhu Lan's - and only $3.50. 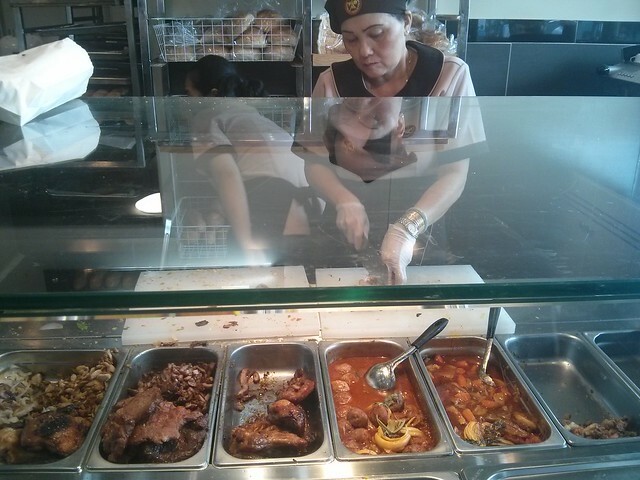 The bread wasn't quite right for a banh mi. Proper banh mi bread should be ridiculously crunchy on the outside, and with the middle gooshing down to almost nothing as soon as you apply some pressure to take a bite. This was a big more dense, perhaps closer to an actual French baguette. 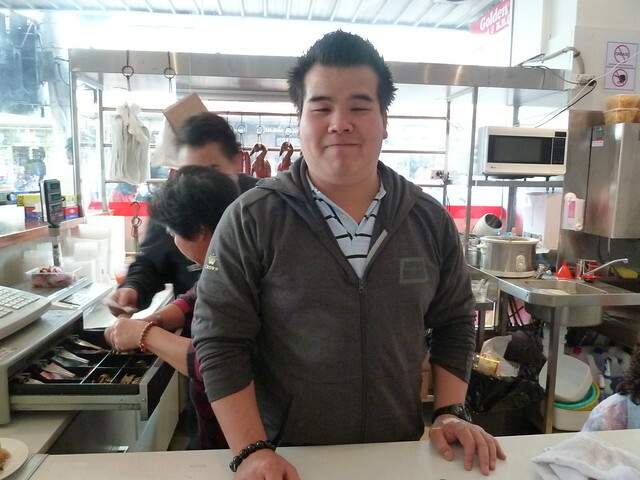 But the fillings were good, and service was with a smile. I'd happily grab another if I was nearby. I did spot quite a few peeps enjoying bo kho, Vietnam's answer to beef stew - big chunks of fall-apart-tender beef plus some tatties in a tomato broth. A small bowl plus a roll will set you back just seven bucks. Coffee was pretty good. 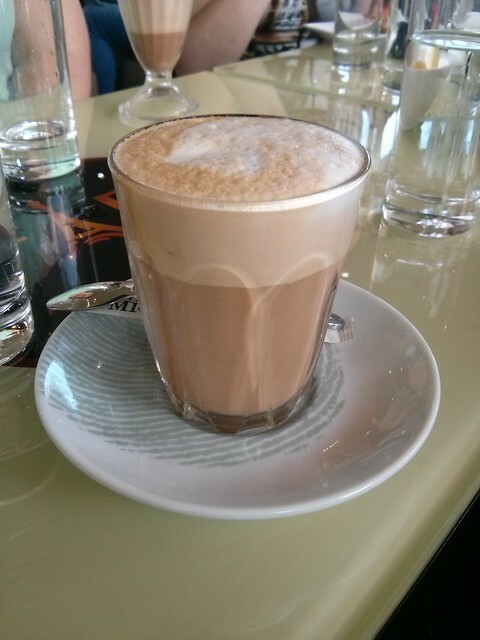 The milk wasn't silky enough and there was too much foam but the underlying shot was well pulled. 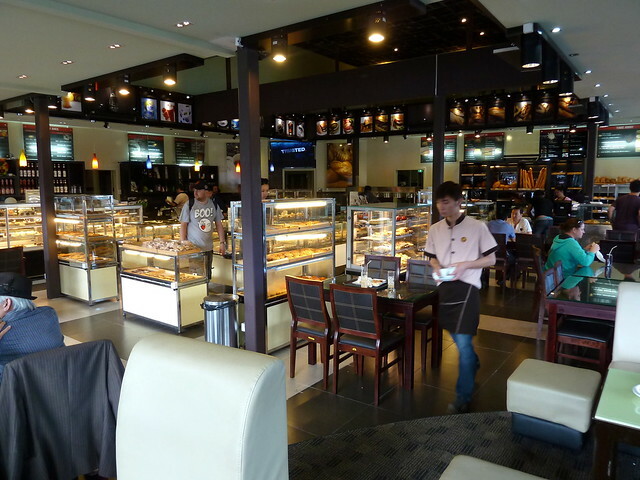 I've seen the barista before at Cafe Cui. French Baguette also have a giant stronghold of cakes in the middle of the store, which you are encouraged to pillage, armed with a tray and tongs a la Breadtop. This is a particular hit with the kiddos, as you can imagine. Most of the cakes are on the big side and a bit OTT for my taste, but I did spy some Greek-style baklava that I've filed for future use. Fun fact: Do you know why my pseudonym when I first began blogging was Ms Baklover? When my husband first moved to Melbourne from Chicago, he became hopelessly enamoured with baklava. 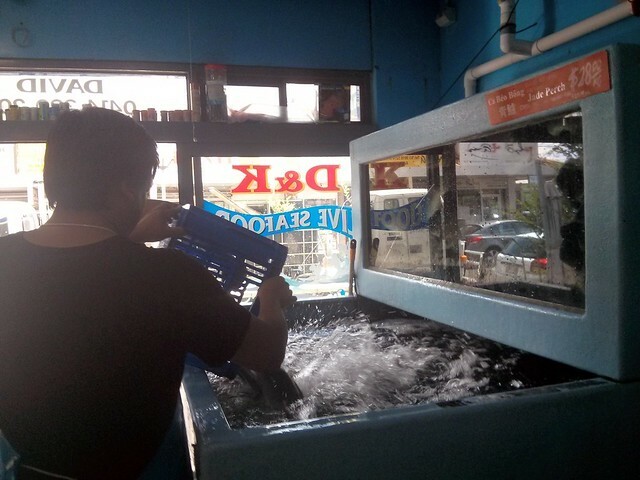 In fact, he became a bak-lover. 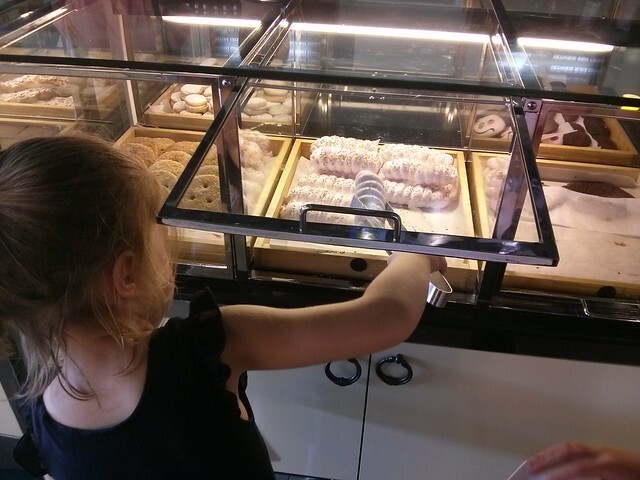 We started our own food blog about the best baklava in Melbourne. I think we only ever did one post before I deleted it (I think I was worried about eating too much - HA. HA. VERY FUNNY, 8 YEARS AGO ME) but the name stuck! French Baguette are still finding their feet. It was a bit of a struggle trying to pin down eight clean glasses for water for our group. I also think they need table numbers on sticks rather than the little rounded ones that sit flat on the table, as right now staff need to roam the whole place looking for you to deliver your coffee. 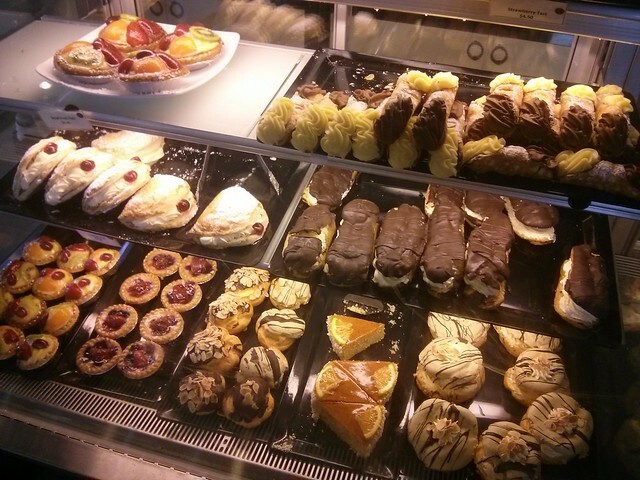 To me, it has a feel like Balha's in Brunswick - a multi-age, multi-ethnic hangout where you go to eat cake and coffee. There's even a mezzanine level. I love this sign. FB, I really hope the last line comes true for you.